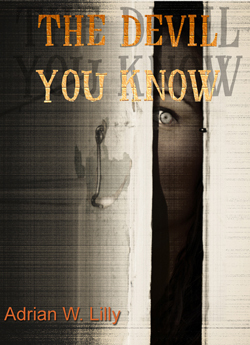 The Devil You Know is a Gothic horror novel, set in October, with its climax on Halloween. Dark black plumes of smoke and steam billowed into the nighttime sky, vanishing in the darkness as they ascended away from the flames flickering from the engine of the burning pickup truck. The truck rested down an embankment at a 45 degree angle, the back end higher than the front. The one working headlight shined directly onto the leaf-covered ground. The shattered radiator hissed in the night. Julie raised her head from the steering wheel and placed a lethargic hand to her head. Her vision blurred and she had the urge to pass out—until she heard the groans from in front of the truck. And looked through the cracked and blood splattered windshield. Beyond the dancing flames, Julie saw the girl she had hit with the truck. She was pinned between the burning engine and a tree. The fire light reflected in the girl’s shiny black eyes as she struggled to free herself, pulling away from the flames. As she pulled, her skin split and blood flowed from the gash. The girl howled in pain as flames danced across her skin. The engine roared and the tires spun, throwing up dirt and leaves. Julie suddenly realized she still had the gas pedal pressed all the way to the floor. She released the pedal. The roar of the engine died down. Julie pushed the handle of the truck door and it fell open with a loud clunk. Julie unfastened her belt and rolled out, falling into the leaves. The engine fire roared higher and the pinned girl howled as the flames overtook her body. Nausea swept Julie and she rested in the leaves, trying to catch her breath. Blackness threatened to overtake her mind again—but she could not pass out. Julie felt panic fighting to control her mind. Julie refused, determined to make decisions, to plan out her actions. Think! Think! Think! Julie felt the heat from the burning truck and lifted herself to her feet and scampered up the embankment. She placed her hand to her head and gently touched the cut on her forehead. She pulled back her fingers covered in blood. Julie wiped her hands on her shorts, and looked down at herself. The shorts and shirt she wore were Paul’s, and the shoes she had on were Paul’s mom’s. Julie’s face grew rigid in determination. She was not going to die tonight. Standing in the road, she looked both directions. Far down the road, but rapidly approaching, points of flickering light raced toward her. Torches! Julie slid back down the embankment. She darted behind a bush and pulled leaves over her body. She waited. The group of towns people raced passed her, only turning their heads to acknowledge the burning truck and dead girl. Among them, Mrs. Ramsden, stopped. Other townspeople continued past her as she looked at the burning truck. She took a step off the road. Her breath rattled from her lungs. Mrs. Ramsden’s eyes drifted across the burning truck to the smashed and burned girl. A horrid howl ripped from the woman’s mouth as she lifted her face to the moon in rage. The moonlight fell across her horse-like face. Julie could see how horribly it was changing, morphing, showing the real face beneath the human flesh. Blood and saliva dripped from Mrs. Ramsden’s mouth, falling on the leaves in front of Julie, splattering on her hand. Julie felt bile rise in her throat and clenched her teeth. She clenched her eyes shut. Mrs. Ramsden rested her hand on the bush above Julie, her long nails clacking against the branches as they twittered in the night wind. The leaves covering Julie stirred with the wind and drifted away, exposing her legs. As her heart pounded, Julie lay perfectly still, willing Mrs. Ramsden to move on down the road. Go away, please go away. Tears sprouted under Julie’s eyes, and drifted down her checks, leaving tracks in the dirt covering her skin. Julie could not believe that 30 days ago, she thought she had a perfect life, perfect parents, and now—now she was here—hiding in leaves, hoping not to die. She heard the leaves crunch as Mrs. Ramsden took another step closer. Read reviews and purchase at Amazon.